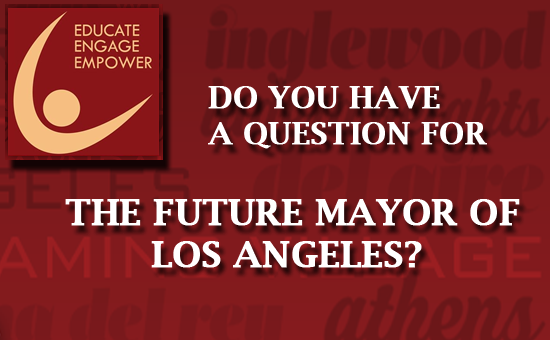 Have a question for the future Mayor of Los Angeles? This year’s annual Empowerment Congress Summit will feature a mayoral debate jointly hosted by the Empowerment Congress and the Second Supervisorial District. The candidates forum will take place at 9 am on January 19, 2013, at the University of Southern California’s Bovard Auditorium. All are welcome to attend, and in advance of the event the public is invited to submit questions for the candidates. Five of the best questions will be posted here for your vote, and the top vote-getter will be provided to the moderator for possible inclusion in the mayoral debate. If you would like to attend the Summit in person, click here to register. If you cannot attend in person, the debate also will be live streamed from http://ridley-thomas.lacounty.gov/live-stream. The entry period is now complete, and no further entries are being accepted at this time. Entries were accepted until noon on Friday, January 11. Questions should be of wide interest to residents and stakeholders in the Second Supervisorial District of Los Angeles County. Questions should not target or be addressed to one candidate. Keep it short: Questions should not exceed 140 characters, including spaces and punctuation.